Blood, Sweat And Wasted Lives: My Experience At The Nigeria Immigration Service Exam A young lady narrates her horrific experience at the recent NIS recruitment exam that ended in tragedy in multiple Nigerian cities. It all started around September 2013 when the Nigeria Immigration Service (NIS) advertised several job positions in different newspapers and on a number of job websites. I had just concluded the mandatory one year National Youth Service Corps program, in other words I was a fresh graduate who had been applying for jobs and attending different job interviews. Living in Nigeria and being unemployed is difficult, especially if one has lost their father and is the first child—a female at that—with young siblings looking up to them. Such is my case. When the Nigeria Immigration Service announced its upcoming recruitment, I was skeptical about it and almost didn’t apply because from my understanding of how things work in Nigeria, one would need to have a parent or relative in the upper echelon of the government before one could even be considered for a government job, and I was just the daughter of a small time business woman. Government jobs in Nigeria are tools for politicking and currying favour, and I wasn’t lucky enough to be a relation of the President, a senator or a minister. Anyway, my friends were applying and looking forward to the exams, with such high hopes and expectations that I soon found myself filling the online form for the NIS job position. After filling the form online, I was asked to pay ?1,000 into the NIS government account as part of the registration requirements. Even though I felt it was wrong of the government to ask for money from unemployed youth who were just trying to survive and carry out their responsibilities, I came up with the money and paid it into the NIS account. I collected and held onto the bank teller as proof of payment. As the registration closed, I waited along with other job seekers for any bit of information as to when the next stage of the recruitment will commence. Weeks became months without any news from the NIS. Sometime in December 2013, I heard rumours that some candidates where shortlisted already and had gotten jobs at the NIS, but they were just rumours and I had no way of confirming the truth so I waited till the year ended. There had been no word from NIS in 2014 until a few days ago, when it was in the papers that the NIS exam had been set for March 15, 2014 with no further information. Now I knew the date for the exam, but not the venue. A couple of days later the NIS sent out extra information urging job seekers to visit the state commands of the NIS for information abiut the venue of the exam. Since I live in Lagos, I hurried to the Lagos State branch of the NIS in Alagbon, Ikoyi where I discovered that the exam was to take place at 7:00 am at the Lagos National Stadium, Surulere and job seekers were to come dressed in an all-white sports outfit. Exam day came and I was there at the stipulated time (like all the other job seekers). There was a crowd of at least fifty thousand people at the stadium. I waited outside in the blazing sun along with everyone else as the gates to the main stadium were locked and there were no instructions from the NIS officers that were hanging around at the car parks. We all waited in the heat of the sun for close to eight hours before one gate that leading into the main stadium was opened and we were asked to move in. All other gates were locked, so we all had to push towards that one gate. By the time I got into the stadium, it was so full that I had to continue standing. Finally we were addressed by an NIS official who asked us to write down our names, application numbers and qualifications on the papers he had given the NIS officers before the exam would start. I waited patiently for the paper to get to me, so I could also write down what was required. While I waited I heard some candidates screaming, and I discovered after making enquiries that question papers had already been given to the candidates on the other side of the field while we were still waiting to write our names down. Everything was so disorganized! The NIS and Nigeria Security and Civil Defence Corps (NSCDC) officers had no clue what they were doing. As jobseekers who had not written down their names protested, the officers drove their government-issued truck to my side of the field and started flinging question papers at us like they were throwing scraps of food at dogs. Candidates started struggling, fighting to get copies of the question papers, mayhem broke out and people started getting injured. I could only watch in shock as all this happened. Job seekers crowded the truck to beg the officers for question papers so they could write the exams, but the NSCDC officers brought out their guns to threaten the candidates. One of them shot his firearm into the sky, starting a wave of panic in which candidates started running, falling and hurting themselves in the bid to get away from the trigger happy officers. I hurriedly picked my bag and struggled along with the crowd to find my way out of the stadium. My family is a small one, and we have already lost our father. I had no intention of being killed by a stray bullet shot by a government officer in the name of job hunting. 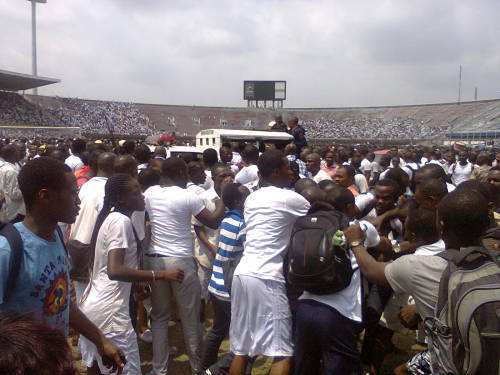 As I left the stadium I heard the news that seven job seekers, people like me, died in Abuja and five in Edo State. I gave a huge sigh of relief when I was able to get out of the stadium, and was thankful that I had survived one of the worst experiences of my life, but I was sad that lives had been lost. People left their homes for an NIS recruitment exam and returned in body bags.